If you own a backyard pond, water feature or water garden, you know the importance of keeping it clean, clear and free of debris. Filtration is essential in removing the debris that can bring down a ponds healthiness and appearance, and we're not just talking twigs and leaves. Filter media helps to trap not only these larger debris, but smaller particles and sediments as well. 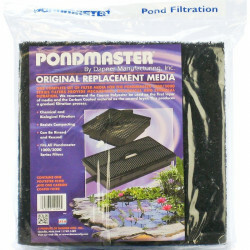 Keeping your pond's filter media clean and whole is an important part of maintaining a safe and beautiful pond. Adding a pre-filter to your water pump will also help to trap incoming debris, preventing jamming and preserving the life of your pond equipment. 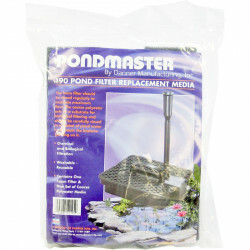 Pet Mountain's Pond Filter Media store features top quality products from the most trusted names in pond care, including Pondmaster, Tetra, Laguna, Lee's, Beckett, Acurel and more. Biological Pond Filter Media provides surface area to facilitate the growth of beneficial bacteria that serve to digest and break down dissolved contaminants in your pond water. These bacteria cultures need ample room to grow and develop in order to treat the most water possible. utilizes the power of specialized particles to deactivate specific dissolved contaminants and particles that can cloud the water. Phosphates, ammonia and other contaminants can cause algae blooms and foster disease in your water, so providing a specialized source of chemical filtration can help prevent tons of problems down the road. 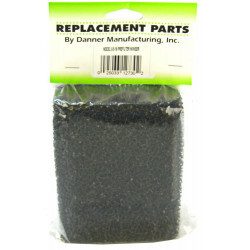 Mechanical Pond Filter Media utilize simple entrapment to catch and remove suspended particles. Carbon is an effective trapping agent that can remove a large variety of unhealthy elements from your pond water.